The Journal of Outdoor Recreation, Education, and Leadership is the only peer-reviewed journal published in the United States with a specific focus on the areas of outdoor recreation, education, and leadership. 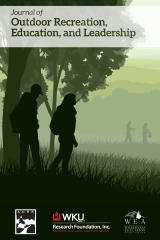 Through this collaborative effort between the Association for Outdoor Recreation and Education, the Wilderness Education Association, and the Western Kentucky University Research Foundation, the journal focuses on improving research and practice and reducing the disparity between the two in the represented disciplines. The journal's mission is to improve outdoor recreation, education, and leadership through the publication and dissemination of peer-reviewed manuscripts. Publishing articles which contribute to the development of theory and practice is a guiding principle of the publication. The journal solicits high quality manuscripts from authors inside and outside of academia. Authors are encouraged to submit manuscripts (relevant to outdoor recreation, education, or leadership) in the following three categories: (1) Regular Papers, (2) Essays, Practices and Commentaries, and (3) Research Notes. See more within Author Guidelines in the About tab. Download full document here [pdf]. Manuscripts are now being solicited by the Journal of Outdoor Recreation, Education, and Leadership (JOREL).